New State Senate district lines, as proposed by the NYS Legislative Task Force on Demographic Research and Reapportionment. CITY HALL — State lawmakers unveiled their redrawn map of the state’s legislative districts Thursday — a plan state Democrats condemned for its tardiness. The proposal, which would shift lines across the state and create a new Asian-American majority district in Flushing, was drawn up by the Legislative Task Force on Demographic Research and Reapportionment. 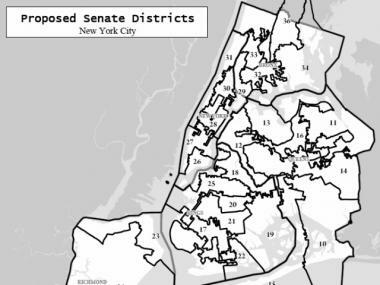 It calls for consolidating much of Brooklyn’s Orthodox Jewish community into a single Senate district, all part of an effort to strengthen minority representation. The map, which is redrawn every decade to reflect population changes in the census count, would also add a new 63rd Senate seat upstate. Republicans currently hold a thin majority in the Senate, making any changes significant. But the changing lines would also pit a number of incumbent Democrats against one another, including State Sen. Michael Gianaris, who represents Queens. “What they have here is so across the line and so outrageous and so brazen, I have confidence it’s not going to stand up at the end of the day,” said Gianaris, who also slammed the group for taking so long to release its plan. “It’s an obvious political tactic. They’re dragging this out as long as they can. “Inevitably this is going to wind up in the courts,” he added. Sen. Liz Krueger also called out the task force for the delay. “The Republicans have been keeping the public in the dark, trying to manage expectations instead of letting New Yorkers see what they've cooked up and judge it for what it is,” she said ahead of the release. State Sen. Daniel Squadron, who represents lower Manhattan and parts of Brooklyn, also slammed the plan as the product of “Republican political shenanigans.” He said his colleagues had broken their pledge for an independent redistricting process. The task force is planning a series of hearings, set to begin Monday in Albany, in which the public can weigh in on the proposal.